EFS plays an essential role, specially when you’re playing with your device beyond the boundaries. You must have read this important point while flashing custom ROMs / custom recoveries or rooting your Android device “Make sure that you backup your EFS”, ever wondered what does it mean and why is it important? Well, if you are not familiar with EFS, let’s first have a brief introduction of EFS. EFS stands for Encrypted File System. In Android devices the baseband information (IMEI) is stored in the form of EFS data, whenever you flash different firmwares there are chances that your phone’s baseband will get effected… So it is always safer to have backed up your EFS before you flash any file in your Android device. This is way too much important, specially when you buy a new phone, the very first thing you should do is to backup your EFS. In case of messing up your EFS will result in bad IMEI, it will either give you a generic IMEI or null. You can understand now what it will do, that means no signals on your device and no network at all. The only way to bring your phone back to the life of signals is flashing the backed up EFS. Let’s get back to the topic. 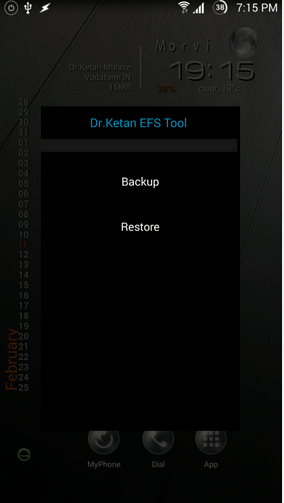 Our friend Dr. Ketan Hindocha, XDA-Recognized Contributor has developed an awesome app that allows you to backup your EFS in just one click on Samsung Galaxy Note 2 GT-N7100 & Samsung Galaxy Note 3 SM-N900. Galaxy Note 2’s development is not going to come to an end any time soon and there is number of tweaks you can make to your phone, so Dr. Ketan has actually eased it more than a lot for the newbies to backup EFS in just one tap. Also, this EFS issue is common with these devices so this EFS Tool will just play the role of a life savior for you here. 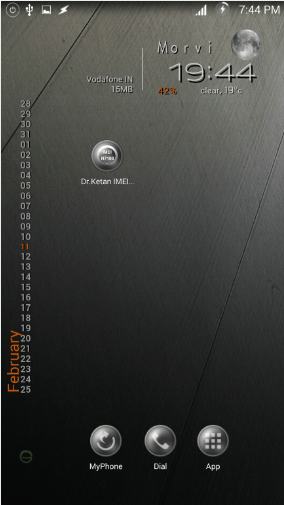 At the moment, the tool is named as for “EFS Tool Samsung Galaxy Note 2 GT-N7100” but as said by Dr. Ketan, the tool also works perfect with Galaxy Note 3 SM-N900 regardless of the name. Let’s have a look at how this app works. -Click on App Icon – This will prompt for backup and Restore menu, select your choice. -When you select backup – It will backup and make efs.img file on Int SD card, also it will create text file just to stamp time,date and device model while you created backup. Now move both file to safer place. -When you needs to restore, put efs.img file (your backup) on root directory of Int SD card, run application and select to Restore. Once restore done, Reboot device. In case you got any queries or face any difficulties, please feel free to stop by the comment box below and leave us your words. We will get back to you as soon as possible.